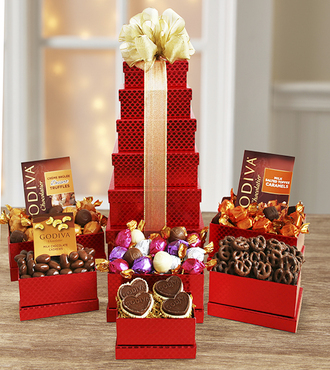 Scale sweet holiday heights this season with this gorgeous red tower filled with treats. They will love the heart-shaped signature Godiva chocolate biscuits, chocolate pretzels, Godiva chocolate- covered cashews, assorted Godiva creme Brule truffles, Godiva milk caramels and assorted dessert truffles. No extra charge for same-day delivery. FREE personalized gift message included. (Extra delivery charge for Alaska and Hawaii) Same-day delivery is NOT available for this item. This item can be shipped via Ground, 2nd-Day Air or Next-Day Air to the continental USA only. See our WEBGIFT Delivery Policy. "The site was easy to follow, great descriptions and fast online ordering." -- Ada M.